Toshiba Corporation has developed a fast, cable-free contactless charger for electric vehicles (EV) , and will field test it on a medium-sized EV bus designed to handle the power demands of regular high-speed journeys on expressways. Field tests will start from June 1 and continue until December. 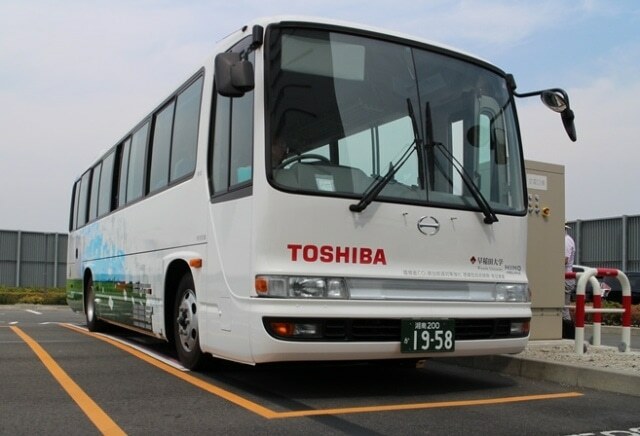 The 45-seat bus is powered by a long-life, high-output SCiB™, Toshiba’s advanced lithium-ion rechargeable battery, and will make regular trips between All Nippon Airways Co. Ltd. facilities in Tonomachi, Kawasaki and Haneda Airport in Tokyo. The 11-kilometer journey will test the bus and its performance under various traffic conditions, and will allow Toshiba to verify the convenience and practicality of contactless charging, along with its contribution to reducing carbon dioxide (CO2) emissions. The battery also delivers high output that, combined with improvement in performance of drive components allows the bus to achieve a top speed surpassing that required for safe operation on expressways. Development of this system has been supported by the Ministry of the Environment under its Low Carbon Technology Research and Development Program since 2014. A field test that deployed a small EV bus incorporating a similar charging technology started in February this year and will run until December. Toshiba will continue research and development of contactless charging and other advanced technologies that contribute to reducing environmental loads, and work to improve the quality of urban transport by providing SCiB™ for various transportation systems.